As floods continue to impact the safety and economic stability of our communities, infrastructure, and valuable farmland, the Iowa Flood Center (IFC) requests your feedback to determine where additional stream sensors are needed to enhance the flood monitoring and prediction capabilities in your area. With this in mind, we are collecting a list of proposed stream sensor locations from partners with localized flood experiences, knowledge of information gaps, and who are actively engaged in their area flood response. Please discuss potential locations of priority stream sensor sites for your communities with your local emergency response team and submit proposed locations by filling out the information requested via this link: https://tinyurl.com/ybqwwoex. Please submit proposed locations by November 2. We will attempt to leverage the list of identified priority stream sensor locations for additional funding and resources. It is our goal to help you with the installation and deployment of more stream sensors. Please note, the IFC currently does not have resources available to help with a large sensor deployment; rather, we are collecting information to demonstrate the need and show support for expansion of the statewide stream sensor network. If funding does become available, our team will assess your proposed locations to determine site suitability. 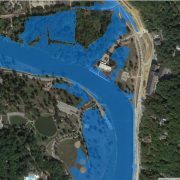 Our IFC sensors provide near real-time river level information at about 250 locations statewide, displaying data every 15 minutes on the Iowa Flood Information System (IFIS). The self-contained sensors are mounted on bridges and operate using solar power. The sensors measure river levels using a sonar signal, and data are transmitted via cell modem to the IFIS public interface. For more information, contact Breanna Shea (breanna-shea@uiowa.edu, 319-384-1729).